This article is about the "Districts" (Kreise) of Germany. For "Government Districts" (Regierungsbezirke), see Regierungsbezirk. Look up Kreis in Wiktionary, the free dictionary. In most German states, the primary administrative subdivision is the Landkreis ("rural district"); the exceptions are the states of North Rhine-Westphalia and Schleswig-Holstein, which use the term Kreis. Most major cities in Germany are not part of any Kreis, but instead themselves perform functions like those of the Kreise; such a city is referred to as a Kreisfreie Stadt (literally "district-free city") or Stadtkreis ("urban district"). 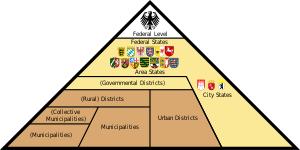 Kreise stand at an intermediate level of administration between each German state (Land, plural Länder) and the municipal governments (Gemeinde, plural Gemeinden) within it. These correspond to level-3 administrative units in the Nomenclature of Territorial Units for Statistics (NUTS 3), and are roughly equivalent to counties in the United States. Previously, the similar title Reichskreis (Imperial Circle) referred to groups of states in the Holy Roman Empire. The related term Landeskommissariat was used for similar administrative divisions in some German territories until the 19th century. The majority of German districts are "rural districts" (German: Landkreise), of which there are 294 as of 2017[update]. Cities with more than 100,000 inhabitants (and smaller towns in some states) do not usually belong to a district, but take on district responsibilities themselves, similar to the concept of independent cities. These are known as "urban districts" (German: Kreisfreie Städte or Stadtkreise)—cities which constitute a district in their own right—and there are 107 of them, bringing the total number of districts to 401. As of 2016[update], approximately 26 million people live in these 107 urban districts. In North Rhine-Westphalia, there are some cities with more than 100,000 inhabitants which are not urban districts, for example Recklinghausen, Siegen, Paderborn, Bergisch Gladbach, Neuss and Moers. Nevertheless, these cities take over many district responsibilities themselves, although they are still part of a larger rural district. Midsize towns can perform particular administrative functions of the district as well, especially to provide common services to the local citizens. The classification as "midsize" town is usually based on a town's registered population, but varies from state to state. A special type of rural districts includes the three Kommunalverbände besonderer Art (Municipal unions of special kind), a fusion of a district-free town with its adjacent rural district: besides the Regionalverband Saarbrücken (Saarbrücken regional association), from 1974 until 2007 called "Stadtverband Saarbrücken" (Saarbrücken town association), there is the Hanover Region since 2001 and the Städteregion Aachen (Aachen region of towns) since 2009. Aachen, Hanover and Göttingen retain certain rights of an urban district (Kreisfreie Stadt); Saarbrücken has not explicitly determined a similar provision in its legislation. Map of German districts. Urban districts are shown in yellow, rural in white. The district council (German: Kreistag) is the highest institution of a rural district and is responsible for all fundamental guidelines of regional self-administration. This council is elected directly every five years, except in Bavaria where it is elected every six years. Usually the administrative seat of a rural district is located in one of its largest towns. However, district council and administrative seat of some rural districts are not situated within the district proper, but in an adjacent district-free city. Most of those rural districts are named after this central city as well (e.g. Bamberg and Karlsruhe). Moers is the biggest city in Germany (and at present time the only one with more than 100,000 inhabitants) that is neither an urban district, nor the district seat of an adjacent rural district. The highest administrative position of a rural district is an officer known as Landrat or Landrätin, who is responsible for the district's day-to-day administration and acts as its representative for official purposes. In parts of northern Germany, Landrat is also the name of the entire district administration, which in southern Germany is known as Kreisverwaltung or Landratsamt. In urban districts similar administrative functions are performed by a mayor, in most greater cities usually by the Lord Mayor. Rural districts in some German states have an additional administrative committee called Kreisausschuss. This committee is generally led by the Landrat and includes a number of additional voluntary members. It takes over certain administrative functions for the district, following decisions of the district council. However, the exact role and regulations of this panel vary greatly between different states. ^ In either case, the plural of the noun is formed by suffixing it with "e". In Germany, the term Kreis is also used informally for any rural district, and (for example in statistical summaries) for a district of any type. ^ A Kreis is not to be confused with a Regierungsbezirk", a state administrative subdivision which exists in only a few of the German states. ^ "Country Compendium, A companion to the English Style Guide" (PDF). European Commission Directorate-General for Translation (EC DGT). February 2017. pp. 50–51. ^ This number includes the "city-states" of Berlin and Hamburg, and two urban districts of the city-state Bremen. ^ "Kreisfreie Städte und Landkreise nach Fläche und Bevölkerung auf Grundlage des ZENSUS 2011 und Bevölkerungsdichte - Gebietsstand: 31.12.2015" (XLS) (in German). Statistisches Bundesamt Deutschland. July 2017. Retrieved 9 August 2017.